1.1.2. A shortcut of ezPaycheck software will be created on your desktop. You can double click it to launch ezPaycheck payroll software. 1.1.3. You will see the license key screen if you have not entered the license key. - Select pay period. ezPaycheck can support daily, weekly, biweekly, semi-monthly and monthly pay periods. - W3 control number and W3 Establishment number (optional): These two fields will be used for W2 and W3 forms only. 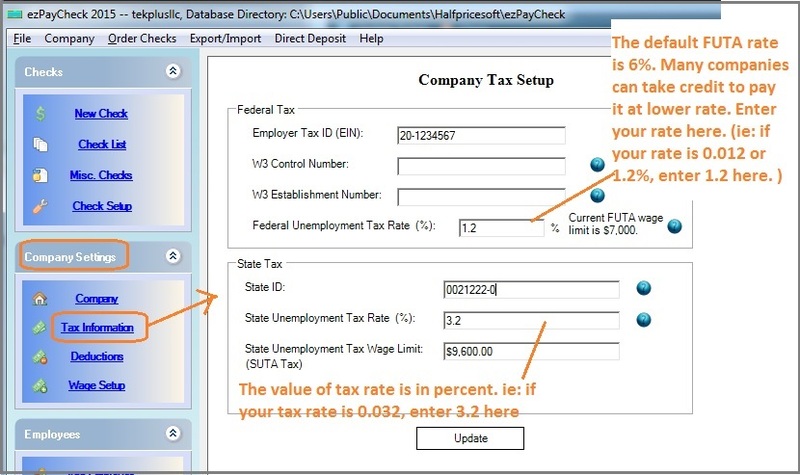 The default tax rate for 2013 is 6%. However, many companies can take up to 5.4% credit. Please check with your local IRS office to see what rate you should use. ezPaycheck payroll software can support up to 7 custom deduction fields. If you need to add a customer deduction to handle SDI, local taxes, fringe benefits, city taxes, occupation tax, you can learn more details here. ezPaycheck payroll software is very flexible. You can customize the payment type to handle salary, hourly pay, tips, commission, bonus, differential pay rate, pay-by-piece, pay-by-load, pay-by-project and more.